Okay, here it is. 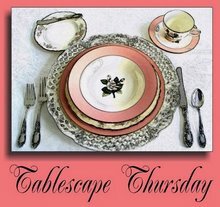 My first entry in Tablescape Thursday hosted by Susan at Between Naps on the Porch. 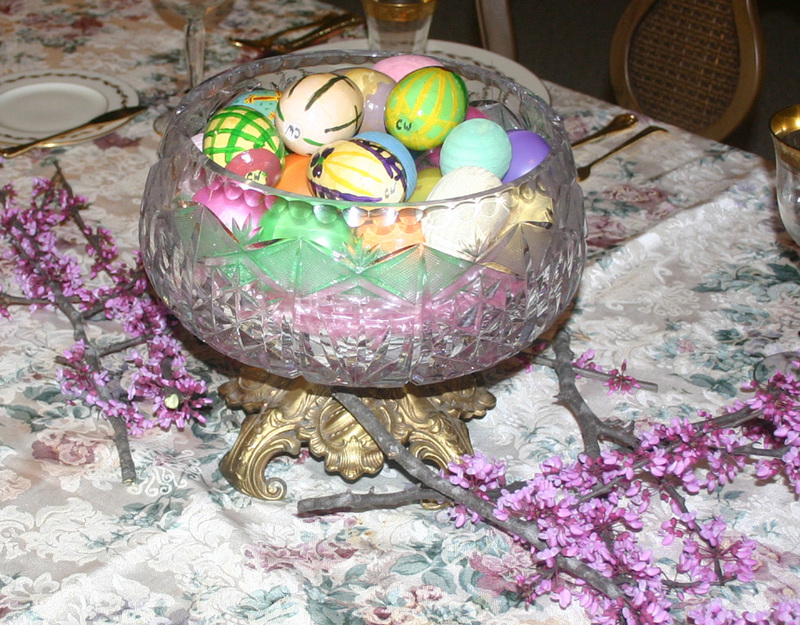 I set a table for Spring and you can find a lot of other inspirational pictures on Susan’s blog. Don’t miss her back porch transformation. I have a little secret for setting my table. I can’t remember where I learned it but I use it every time I set my table. If you notice, all of the utinsels and main plates are aligned. The trick I use is to place the plates and utensil the distance between the tip of my thumb and the first knuckle from the edge of the table. This gives a polished, finished look to the table. Now, I collect books on table settings and etiquette and absolutely love table settings. When I go to a restaurant that places all of the utensils on the same side of the plate the first thing I do is put them in their proper place so I feel comfortable. 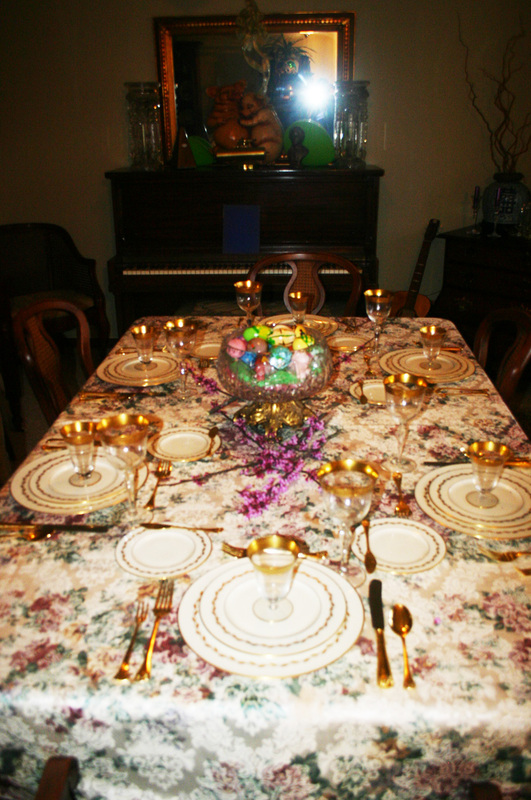 I learned table setting from Mama. We always set the table for our evening meal with a placemat, knife, spoon, fork, plate, glass and napkin. I learned at an early age how to set them all in their proper places. On Sundays we would set the table with a tablecloth and nice china. That is another great thing my Mama taught me – use your good china. To this day, I never understand people who put their best china in a cabinet and never use it. So what if something gets broken? That is part of life and part of being a good hostess is taking things in stride and dealing with situations graciously. Combine chicken, pecans, strawberries, onion, celery, vinegar, and oil. Cover and marinate in the refrigerator for 1 hour. Serve over salad greens. Thanks for all of the tips! I like a proper setting as well. I love the idea of using china and a tablecloth on Sunday’s to make it more special. I wish I had someone to cook for since my son can no longer eat (disabled and uses a feeding tube). Your table looks just lovely. Love the way you have used the redbuds or are those cherry blossoms? So pretty and springy. Your dishes and stemware are so lovely. I love classic white and gold. Happy Spring. What a pretty tablescape! I loved the added touch of your little flowered branches. Have a great weekend!! Very Pretty Table! 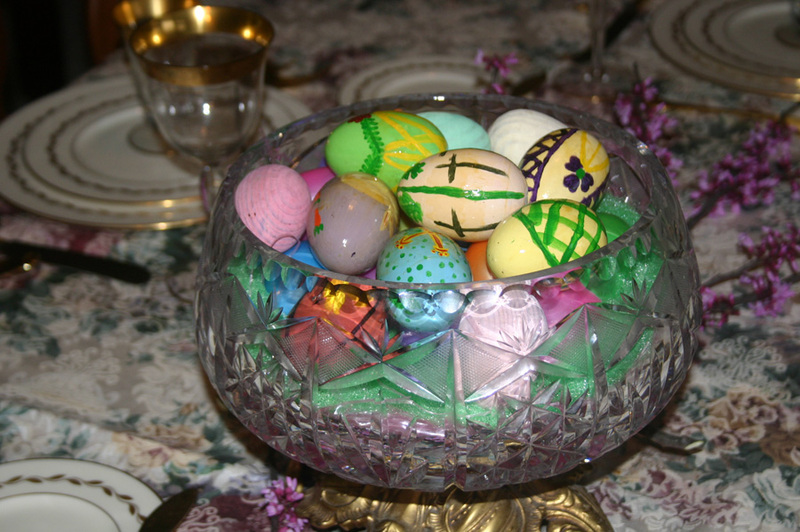 I love the eggs, they are beautiful! Thank you for your comments on thebloomgirls.com blog! 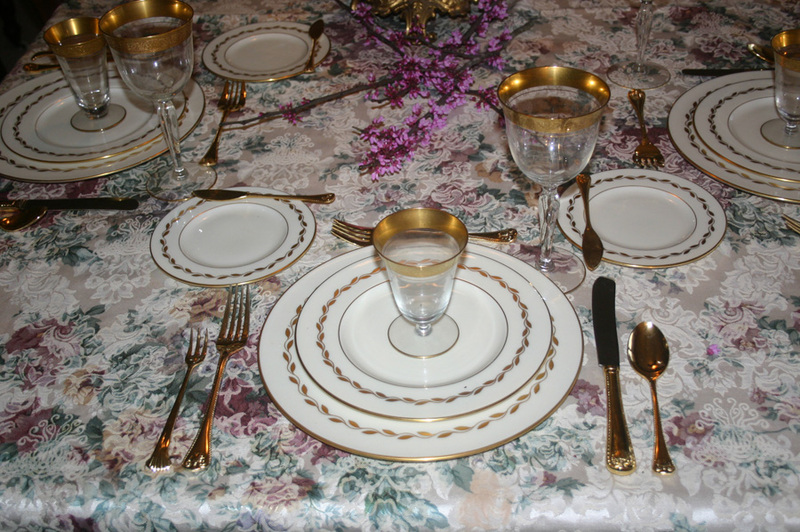 The dishes for my tablescape are made by Silvestri and were designed by Carol Eldridge. I bought them years ago but I have seen some of the pieces on http://www.replacements.com. They are a lot of fun and my 4 year old things they are great! Fabulous first tablescape post! Thanks for secret tip, but I’ll probably forget it by next week. I wish I was raised in the south, you all have such good manners & class. Lovely table; it is so elegant and absolutely perfect! Thank you for sharing, and also for your tip for getting perfect placement. Excellent! 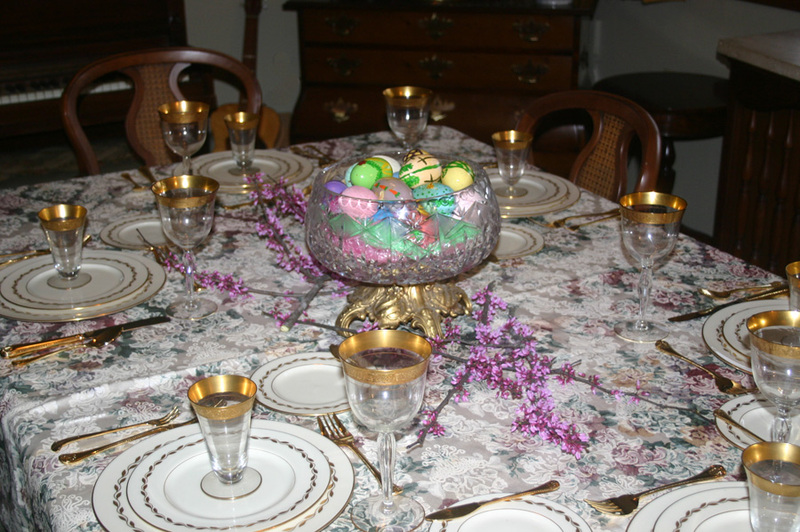 The Windosors – now I know I can get a job on the royal table setting staff – ha ha! What a great tradition that you learned from your mother! 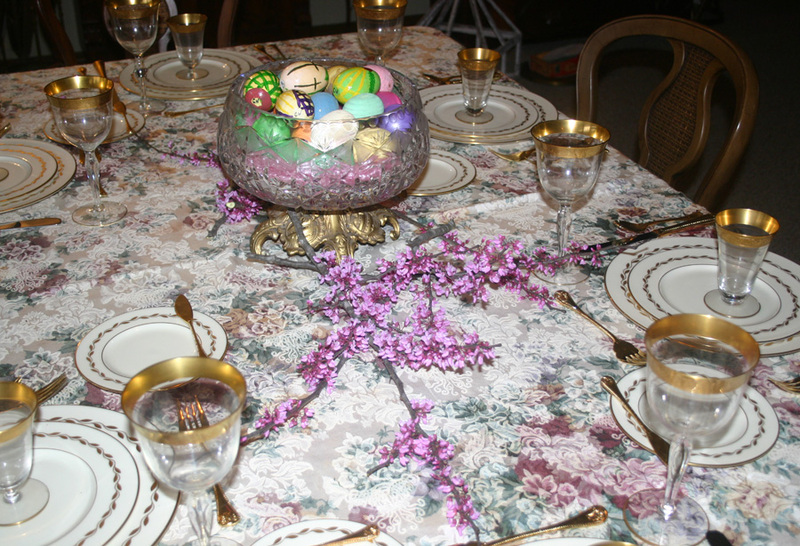 I love your tablescape, I can just picture rows and rows of cherry blossoms down the street! I was watching a series on the Windsors and they were having a big party, and the staff uses a little trick like yours to set the table too. Very pretty table. Thanks for the helpful hint. There will be no excuse for me you have a non aligned table now 😉 Salad sounds delicious and I hope to try it soon. I agree with you and your mama, don’t save it, use and enjoy it. That’s what I like about you Southern Belles. You all know how to set a pretty table. Do I see ceramic bunnies on top of that piano? Happy TT & I love the finishing touch with the branches. Oh my! Your table is so pretty! I LOVE the branches and the buds. So beautiful! I also love that recipe. It is one of my favorite kinds of salad! Simply scrumptious! I am so glad I could meet you today. I love anyone that sets their table properly even at a restaurant! What an elegant and lovely table. And the chicken salad sounds yummy, too! I must remember that alignment rule. I love how you cut the branches for your table. It’s just so nice to have something from nature on the table. Yes I sure would love to have you over for a fresh mimosa anytime! Hi Christi! Your dishes are so elegant. Love the white and gold. I love the branches with the blossoms on the table. Sweet! Christi, it’s beautiful! You know I do the same thing about rearanging the utensils on a table. I try to do this discreetly when I am at someone’s home though. I have been teaching Danielle how to set a table correctly and she loves it.